Ocean Diver is the BSAC entry level course. Qualified Ocean Divers are permitted to dive with experienced divers, or divers of a similar grade within specific limits. Ocean Divers are qualified to dive to a maximum of 20 metres. The exact number of pool sessions or open water dives may vary slightly depending on ability, as we make sure everyone progresses at a safe rate. The pool and theory sessions are held by the club’s instructors on Tuesday evenings at the Queen Mother’s Sports Centre, and afterwards at the Jugged Hare pub. 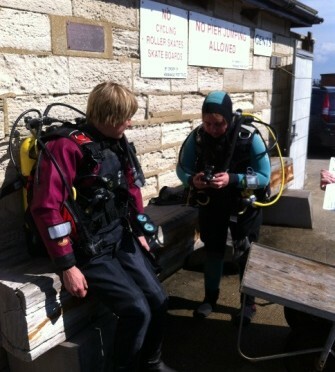 The open water dives are conducted over a weekend at an inland site, often Stoney Cove. The training is designed to help new divers understand how to use scuba equipment, safety issues, and provides practical experience of diving. The open water dives give you the chance to try your new skills outside of the pool. You will start with a shallow dive to get you settled, before getting progressively deeper over the weekend. BSAC provides more information about the Ocean Diver training course.